The use of industrial robots continues to grow, not just in the U.S. but around the world. Implementing an industrial robot drastically improves productivity. Robots are able to work 24/7 if necessary and do not require breaks. They help reduce product cycle times, increase throughput, improve consistency, and lead to greater efficiency. All of this helps improve the overall process and lead to higher profits. 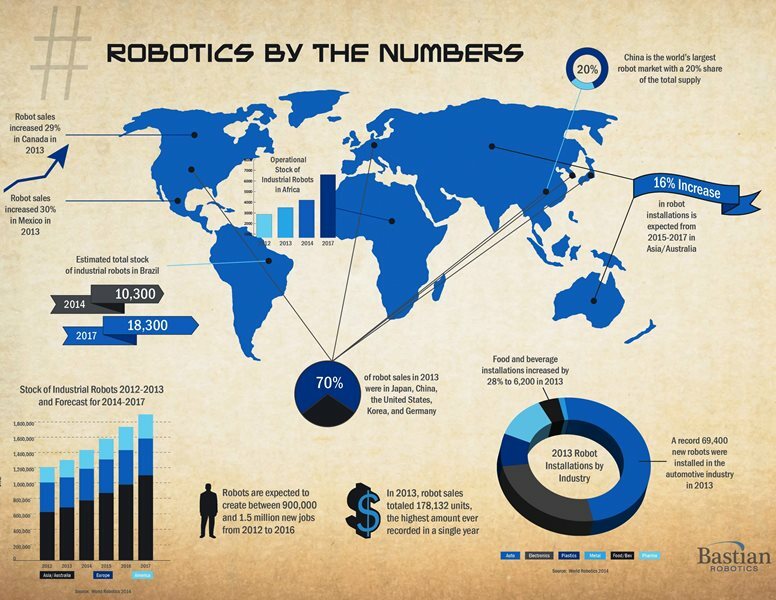 It is estimated that over 200,000 industrial robots will be installed worldwide in 2015. This number is 15% higher than the amount of installations in 2014. As industrial robots become more advanced, and innovative technologies are brought to the forefront, new applications are revealing themselves. From packing product and palletizing cases to loading trailers and tending machines, industry is continuously finding more and more uses for robots. As these new applications are discovered, demand for industrial robots increases, there is a rise in the number of installations. Japan, China, Korea, Germany, and the United States accounted for 70% of the total robot sales in 2014. While these countries are well-established in the robotics market, new countries are starting to invest heavily in industrial robots as well. Mexican customers recognize the advantage of purchasing systems through local engineering integration companies working side by side with a top of the line conveyor manufacturer and materials handling solutions. Mexican customers require, insist, and demand the local personalized service installation and support. Without the "boots on the ground," the trust and relationship between customer, vendor, and integration partner is lost. Guillermo Albaladejo, Latin American Director at Bastian Solutions share the company opened operations in Mexico in 2012 because large opportunities made the decision to enter and serve this fast-growing market necessary and in the best interest of serving the customers. Modern Materials Handling recently reported that Conveyor Equipment Manufacturers Association (CEMA) president Jerry Heathman (and CEMA's Directors) approved expanding membership to all of the countries in the Americas. Heathman noted that the Americas are natural and historical markets for the Membership and generally use CEMA and North American standards. From increased sales and installations to more affordable robots and quicker ROIs, all evidence points to the multi-billion dollar market of industrial robotics continuing to grow for years to come. Robots will continue to have a major role in manufacturing and production across the globe. Combined with the high demand for conveyors, the prognosis for material handling growth continues to be very optimistic indeed. **Emily Scott with Bastian Solutions was a significant contributor to this feature article. (www.BastianSolutions.com).